Corrosorber adsorbs hydrogren sulfide and other corrosive gases while VpCis (Vapor phase Corrosion Inhibitors) condense on the metal surfaces. Corrosorber will not interfere with the VpCI protection, but instead will help adsorb the gases that cause corrosion. Corrosorbers are packaged individually in cellophane and are shipped 10 per carton. Each Corrosorber measures 2.3" in diameter by 1.27" high. Metals are readily attacked by gases such as hydrogen sulfide, volatile mercaptans, etc. Severe damage or failures occur due to the presence of these corrosive species. Corrosorber adsorbs hydrogen sulfide and volatile mercaptans, removing them from the atmosphere and eliminating the cause of some damage to metals. The chemicals contained in Corrosorber have been specially treated to change color from off-white to black as corrosive gases are trapped. In addition, unlike most of the products on the market, Corrosorber will not release the corrosive gases back into the atmosphere. The reaction is irreversible, eliminating any concern about post contamination. 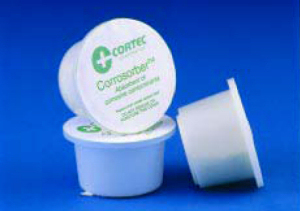 Corrosorber is non-toxic and has no effect on the environment. It can be handled without safety equipment. Install the Corrosorber at the earliest possible time, possiblyl even before shipping or receiving. Simply select a space within any enclosed device where corrosion protection would be useful, and attache with adhesive backing. Replace cup as soon as the container appears gray. Up to two years under typical conditions or until color changes from off-white to black. Typical conditions: 10 cubic foot enclosure, 1ppm of hydrogen sulfide, 1 air change on a daily basis.